Made by Momo: Best of Friends! Hope you are all doing fantastic! Today is my turn to post on the on the Pink By Design Blog and I have been wanting to try a paper piecing technique for a background using coordinating papers. I also have been trying somethings out of my confort zone. I am more of the cutesy cricut card maker, but I have been trying to do things a little different. I hope you are all enjoying this little journey with me!!! 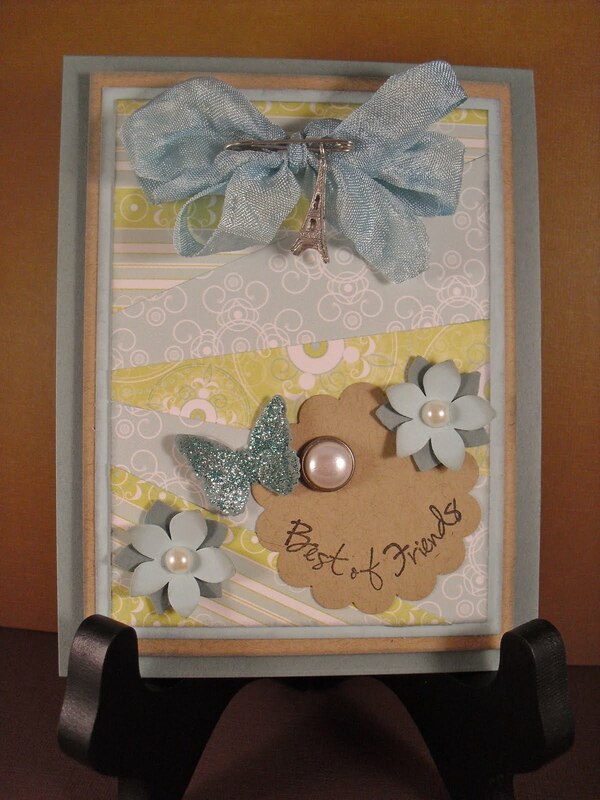 The stamp set and crinkle ribbon can be found at the Pink By Design Store along with some other amazing products! Go check them out! Much love to all of you and thank you to all of you that always leave me comments or come and visit! I love you all! This is so pretty Momo!! I love what you did with the background papers. I love the new look you are trying. TFS. Very nice card,momo... I love the colors, the pearls and the charm. Very nice style. Keep up the good work! It's absolutely beautiful Momo. You did a great job!!! Gorgeous card! I love your cutesy style, but this is really breathtaking! I love the card! The colors are just beautiful! Just beautiful! Love the pearls...just the perfect added touch! I love the colors! Very nice! This is so pretty, Mari! I have some blog awards for you at http://prettypaperprettyribbons.blogspot.com/2011/08/holy-blog-awards-batman.html. Feel free to take one or all of them...and don't worry about all the "rules". Just grab them and go! You deserve it!